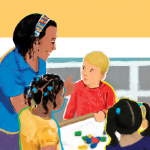 As children approach preschool age, their needs begin to change. This is the first of four classes designed to better understand children as they approach school-age. You will identify characteristics of social and emotional development and learn techniques for promoting appropriate and effective discipline for preschool children.